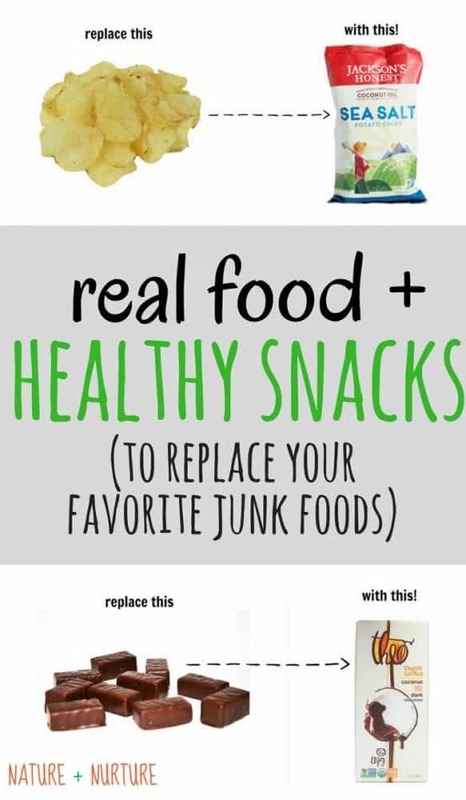 Let’s explore healthy snacks and real food to replace that junk food! These alternatives taste much better than their fake-food counterparts. It’s easy to think that eating healthy snacks and real food means cutting out your favorites. Well, I’m here to tell you it doesn’t have to be that way! I’m talking about replacing items like for like – but with a MUCH healthier alternative. I like to call them real food swaps! Healthy snacks and real food options for your favorite foods do exist. All it takes is paying special attention to food labels. 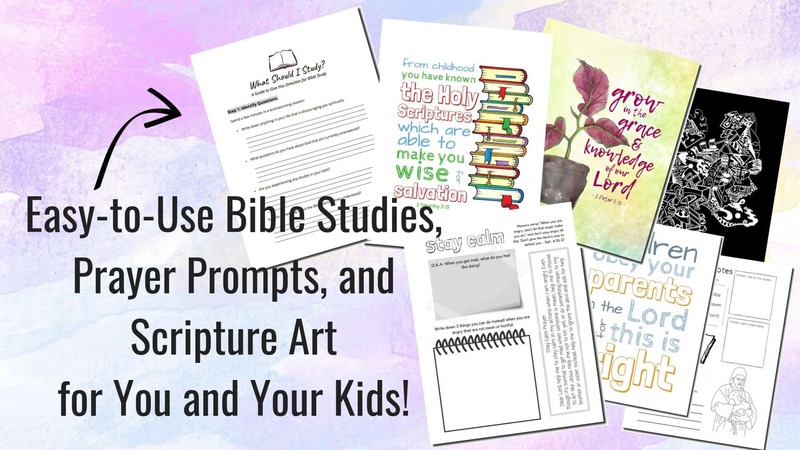 And I’ve already done the groundwork for you with these incredible options below. Enjoy! First, let’s look at everyone’s favorite comfort food: bread. The problem with bread isn’t the grain itself – it’s what we’ve done to it. Read this enlightening post about why many people are wheat-sensitive today. Basically, it’s not gluten that’s the problem for most people – it’s the poison it’s sprayed with that’s irritating people’s intestines. Ick! 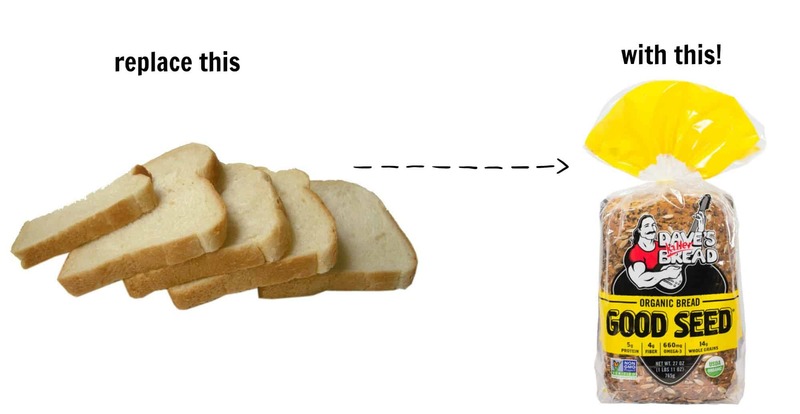 Replace standard white or wheat bread with Dave’s Killer Bread! This stuff is seriously amazing, ya’ll. First of all, it’s organic and Non-GMO Project Verified (which means no yucky chemicals have been sprayed on the wheat). It contains no preservatives or artificial ingredients. Additionally, it’s nutrient-dense and filled with whole grains and hearty seeds. Read the ingredient list – there’s not a single offender. If you’re new to healthy bread, they have milder versions such as Honey Wheat. Dave’s bread is not just the bookend that holds all the good stuff in a sandwich – it IS the good stuff! Where to buy: If you have a large Kroger in your area, they should carry it. Alternatively, there’s a vendor locator on their website, or you can buy online. Many times at my local Kroger, they have it on sale for $3.99 a loaf! Next, a personal favorite of mine – peanut butter! Peanut butter can be a nutritious food but again, the way it’s made matters. Ingredients to watch out for include sugar and PUFA oils (palm oil, hydrogenated vegetable oils). Read this article for more info on why these oils are unhealthy. Replace your typical peanut butter with natural peanut butter! A good quality natural peanut butter contains 2 ingredients: peanuts and salt. That’s it! 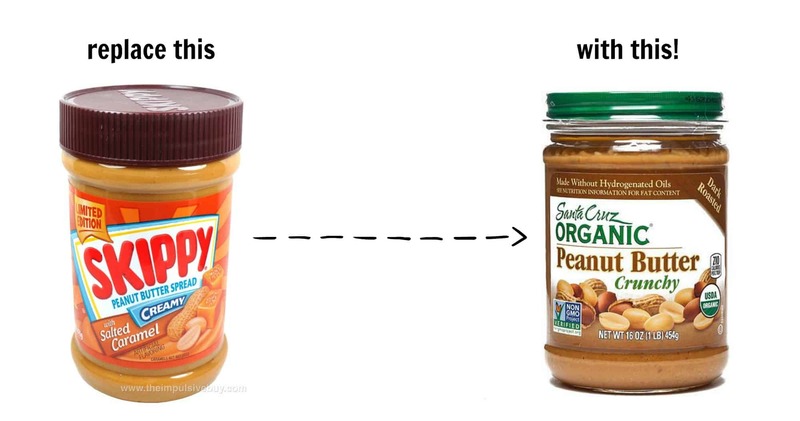 There are actually a lot of good options for natural peanut butter out there. Look for non-GMO and organic. Where to buy: You can find natural peanut butter at pretty much any grocery store. Some options include Smucker’s Organic, Crazy Richard’s, Justin’s, and Santa Cruz (my favorite so far – get it here). You may be thinking, “Wait… are you saying “natural flavors” are bad? But it says natural!” I know. 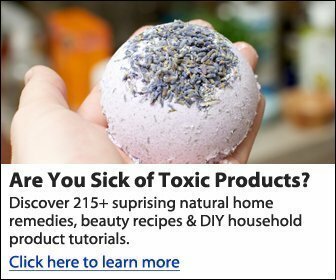 Most of us know artificial flavors derived from petroleum aren’t good for us, but the with the words “natural flavor” food chemists and companies can put whatever they want in your food that is “generally regarded as safe” including excitotoxins. Natural flavor can legally contain natural occurring “glutamate” bi-products like MSG – which are known excitotoxins. These excitotoxins are some of the chemicals that cause your taste buds to experience irresistibility when it comes to food. 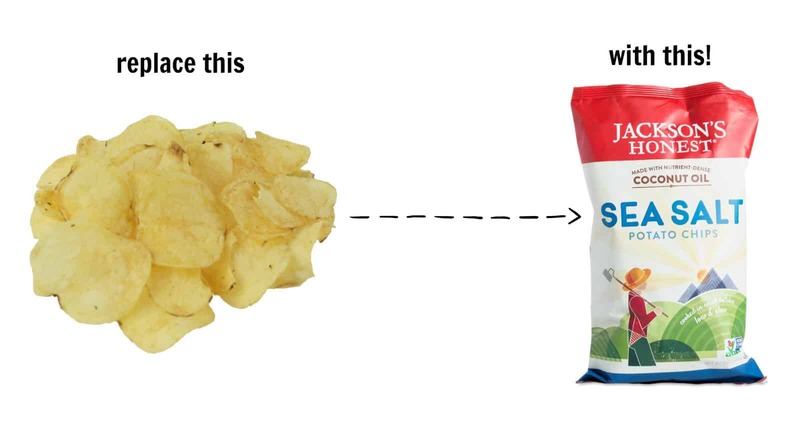 Ever wonder why you can’t just eat one chip? Or one cookie? Or why you remember a taste of a product so distinctly and crave uncontrollably? Excitotoxins can be to blame. Excitotoxins overexcite your cells literally until they die or are damaged causing “injury” and “incapacitating” you with disease. When consumed over time, excitotoxins can cause nerve disorders resulting a myriad of diseases from stroke to Alzheimer’s to Parkinson’s. Read more. I’ve tried different types of “natural” ice creams in the past, but most of them contain ‘natural flavors.’ Then, I found it. 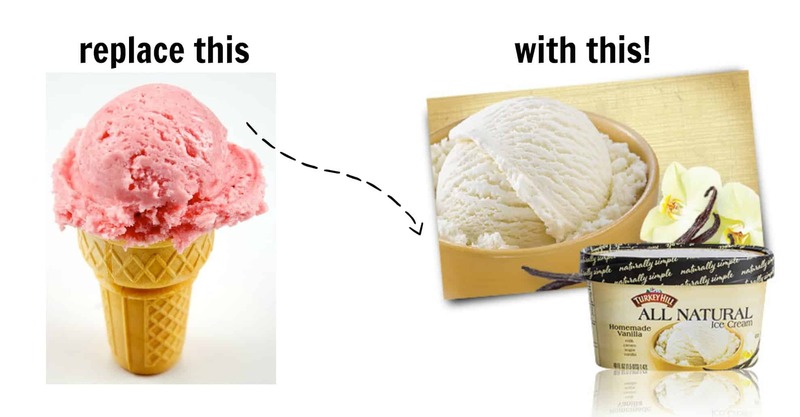 Replace your typical brand of ice cream with Turkey Hill All Natural! The only ingredients are milk, cream, sugar, and vanilla. That’s it – seriously! An even better idea is to make your own ice cream…. but I don’t have time for that in this season of life. Where to buy: there is a handy “Where to buy” page on the Turkey Hill website. They carry the “All Natural” brand at my local Kroger. Again, with the PUFA fats, which are abundant in potato chips. Guys, I love fried food. Seriously. 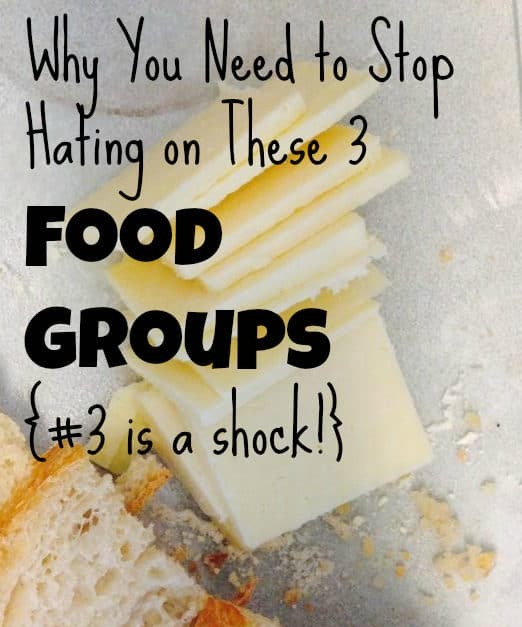 But every time I eat something fried in vegetable or peanut oil, I get a stomach ache! Without fail. The other day I ate some chicken wings I didn’t know were fried, and BAM! Such a horrible stomach ache. The other thing to watch out for when it comes to potato chips is sodium intake. Chips are notorious for high sodium, and it’s usually a good idea to choose a lightly salted version when buying your chips. To find out how much sodium you need, here’s a super comprehensive guide on sodium from Positive Health Wellness. I thought I would have to give up my love for potato chips, until I found these babies. Replace generic potato chips (fried in canola or vegetable oil) with Coconut Oil Chips! These are fried in coconut oil, a healthy type of oil that does not mess with your body in strange ways. Actually, coconut oil is great for you as you probably already know. Also, you can find chips fried in avocado oil, another healthy alternative. 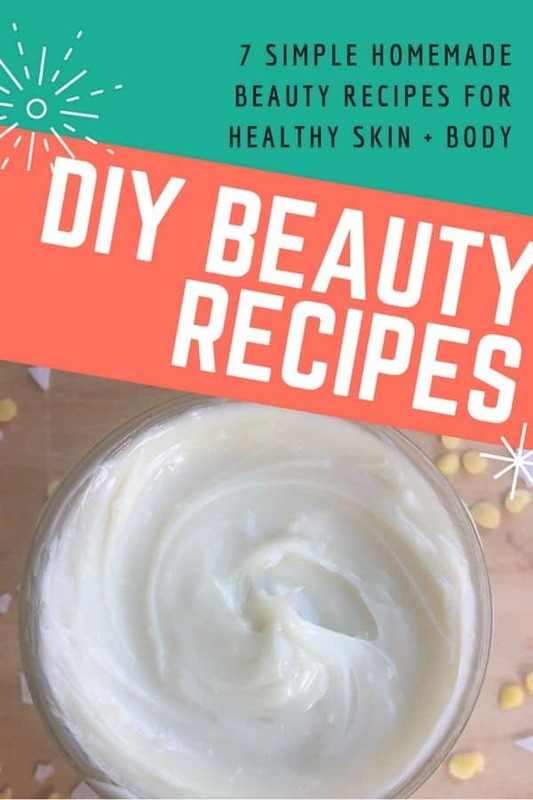 Ingredients: Non-GMO potatoes, organic coconut oil, and sea salt. Where to find: Again, at large Kroger stores – they carry a brand called Boulder Canyon. I’m seeing a pattern here… You can also find them online here – including sweet potato and purple potato versions! The Jackson’s Honest brand is a great one – check it out here. Next, let’s talk about everyone’s favorite beverage. Granted, it’s not technically a food, but I still think it’s important enough to make this list. I’m not a soda drinker, but when I have a slice of pizza… man, do I crave it. The problem with today’s sodas is that they are filled with artificial (made in a lab) colors and flavors. Even worse, diet versions contain excitotoxins which actually cause weight gain and numerous other problems in the body! Read this article for more on the dangers of sugar substitutes. 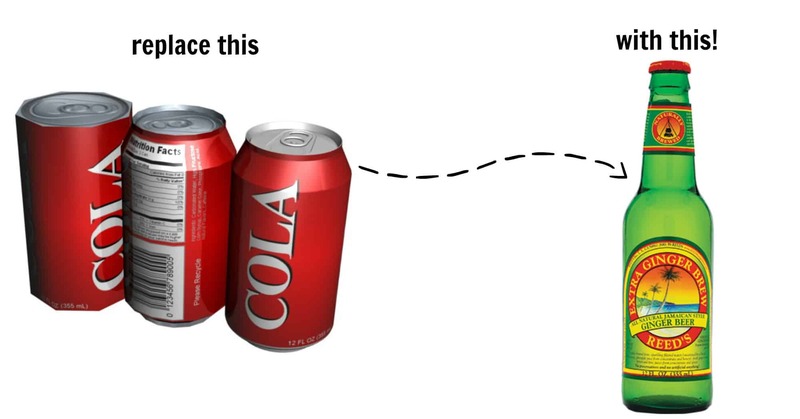 Did you know that there are old-fashioned, traditional sodas that can actually be good for you? Replace regular soda pop with Reed’s natural sodas and brews. They have incredible root beer and several other flavors but my absolute favorite is their Extra Ginger Brew. This was life-saving when I got food poisoning a few months ago. So stinkin’ good. Ingredients: Sparkling Filtered Water (Sweetened by a blend of raw cane sugar, pineapple juice from concentrate and honey), Fresh Ginger Root, Lemon and Lime Juices from concentrate and spices. Where to find: You may have to hunt a little bit more for this one. They carry it at certain Kroger stores, health food stores, etc. You can also purchase online. 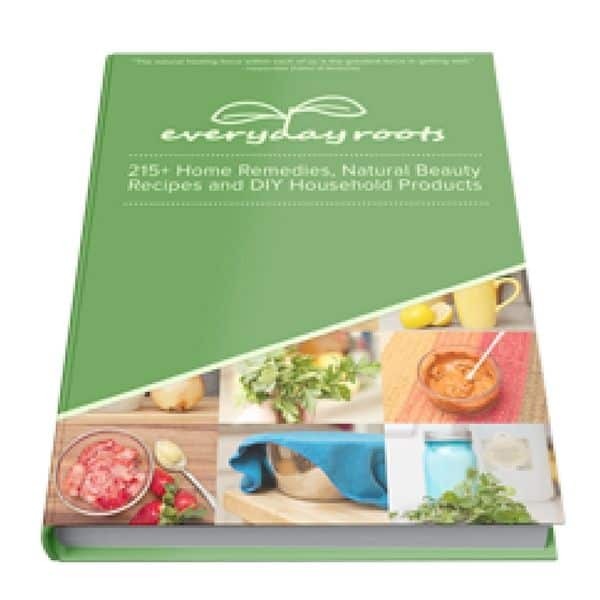 Alternatively, here’s a recipe for homemade root beer from Wellness Mama. Did you know you could do that? Pretty cool. Finally, the ultimate of all foods. 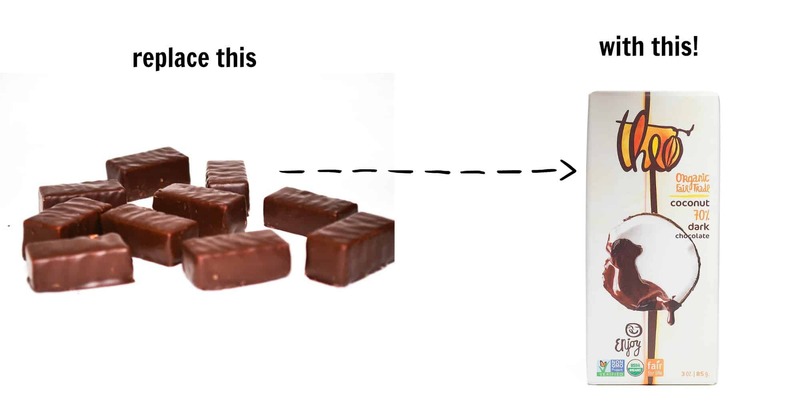 Ahhh, chocolate. How can I ever live without you? Chocolate is one of those deal breakers for a healthy lifestyle. Seriously, if I must give up my chocolate to be healthy, it’s not happening! It’s just that important. Thankfully, you don’t have to give up chocolate for the sake of health. Just read the ingredient lists on your treat of choice – the fewer ingredients the better. Another good rule of thumb for chocolate is darker = healthier. In all transparency, this is one area I need to “clean up” in my pantry. I tend to just grab whatever dark chocolate chips are on sale, regardless of what emulsifying agents are added (often GMO soy derived). There’s a better alternative! Replace standard chocolate bars with organic dark chocolate. I really want to try this one – Theo Organic. Ingredients: Cocoa Beans, Sugar, Ground Vanilla Bean. Doesn’t get much better than that! They have several flavors including coconut, almond, orange, and classic dark. There are other good brands too such as Endangered Species, Lily’s, Divine, and Lulu’s. Where to find: Kroger, health food stores, or online here. Also, here’s a great resource on health food that’s affordable and accessible for everyone: Thrive Market. They carry tons of real foods and healthy snacks at budget-friendly prices. Come up with your own real food swaps and tell me about them in the comments! Want more tips on taking care of yourself? Get my free wellness guide, “Nourish”! I hope something on this list sparks motivation in you to try some healthy snacks! Which one will you try?